Direct detection of the receptor function has been established by means of intramolecular FRET. For receptor sensors, both a FRET donor and acceptor needed to be inserted into conformationally sensitive positions of the receptor. For optimal receptor sensors, a distance between the fluorophores close to the Förster radius (~5nm) is required. Based on recent structural models on how transmembrane helices move during receptor activation, the third intracellular loop and the (truncated) C-terminus of the receptor were chosen as promising positions for fluorophore insertion. More precisely, Vilardaga et al. mapped suitable fluorophore insertion sites to regions distal of the fifth transmembrane helix and to the C-terminus 20-30 residues distal to the 7th transmembrane helix . 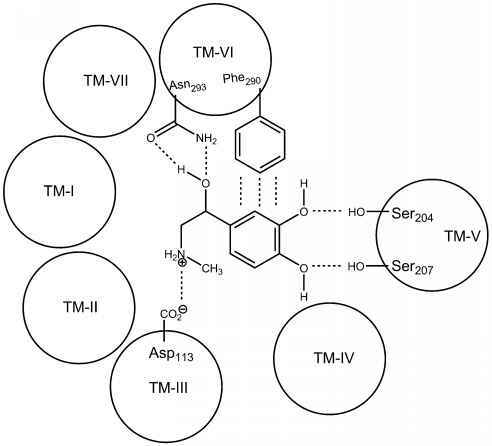 This approach was initially validated for the PTH receptor, as well as for the a2A-adrenergic receptor (see Fig. 10.4). Later, it was transferred to several other GPCRs including ß-adrenergic  and adenosine receptors  . Insertion of CFP and YFP into the receptor gave rise to receptors that exhibited functionality toward G protein activation, albeit at a much reduced coupling efficiency. The replacement of YFP by flash within the third intracel-lular loop allowed measurement of receptor activation in receptors fully functional in terms of G protein signaling  . Structural activation models for receptors predicted that the distance between the fifth helix and the C-terminal part of helix 7 will increase upon activation. This prediction was supported by two recent crystal structures of opsin, which most likely display different activation states [74, 75]. Therefore, a decrease in FRET upon activation of receptors was anticipated and indeed could be experimentally demonstrated (see Reference 73 and Fig. 10.4). However, distance changes within the compact receptor molecule were not expected to be very large, and consequently, agonist-induced changes in FRET were expected to be rather small. Thus, a key to the success of the experiments was a robust and sensitive measurement technique. FRET between CFP and YFP can be easily detected by many methods. However, subtle changes in FRET are much more difficult to measure reliably. A major problem is the inherent property of these fluorophores to bleach quite quickly. Even worse, in the case of strong FRET, the donor is somewhat protected from bleaching, leaving the acceptor exposed to pho-tobleaching. In other words, FRET is particularly prone to photobleaching. Figure 10.4 Detection of the conformational change associated with agonist-induced receptor activation by means of intramolecular FRET. Yellow and cyan fluorescent moieties were tagged to conformational sensitive domains at the C-terminus and the third intracellular loop of GPCRs. Upon ligand -induced activation of the receptor, conformational changes of the receptor were translated into changes in distance and/ or orientation of the inserted fluorophores, resulting in an attenuation of intramolecular FRET. The representative single cell FRET recording of a cell expressing the a2A-FRET receptor demonstrates partial FRET responses to saturating concentrations of clonidine (10 |M) compared to responses evoked by noradrenaline (100 |M). Therefore, it requires caution to determine whether the agonist or the photo-bleaching effect decreased the apparent FRET signal. Assays that allow measurement of FRET with high temporal resolution and fast application devices for agonists are very useful for inducing and detecting FRET changes fast enough to distinguish them from photobleaching effects. Obviously, more sensitive light detectors will also help to minimize excitation intensities, and therefore reduce photobleaching. reflecting relative movements at the intracellular attachment points of the fluorophores . The kinetics of the decay of the FRET signal was dependent on agonist concentration. At agonist concentrations more than 200-fold higher than the dissociation constant, the speed of activation was maximal. These measurements demonstrated that receptor activation can occur within tens of milliseconds in the case of receptors activated by small ligands. Even though receptor activation can be much faster than previously reported for purified receptors, it is considerably slower than those of ligand- gated ion channels which can operate within 1-5ms  . The GPCR rhodopsin is known to be activated within a timescale similar to that found for ligand-gated ion channels. Since rhodopsin is activated by light-induced isomerization of cis-retinal pre-bound in the ligand binding pocket, the difference in activation kinetics of rhodopsin and ligand-operated receptors could be related to the binding event itself. Given that the binding pocket for adrenaline and adenosine is known to be buried deep within the receptor, one might speculate that the actual rate-limiting step in receptor activation is the actual binding process of the ligand. For PTH receptors, FRET-based detection of the binding of fluorescent ligands to fluorescent receptors revealed a two-step binding process. Fast binding was observed to the N-terminal part of the receptor, whereas binding to the "body" of the receptor was slower and coincided with the actual conformational switch corresponding to receptor activation  . Whether the binding of the complex of PTH and N-terminal part of the receptor  to the binding site on the receptor is comparable to small ligand binding such as neurotransmitters is questionable.